Home Unlabelled A few products i use on my hair. A few products i use on my hair. I am one of those girls who can never find the perfect products to work on my hair so i have to use a combination of things, which basically ends up making my hair go greasy quicker. I don't use the products if i have nowhere to go but i do shampoo and condition my hair still. My main problem with my hair is that it's curly and when it's straightened it doesn't stay straight for long. 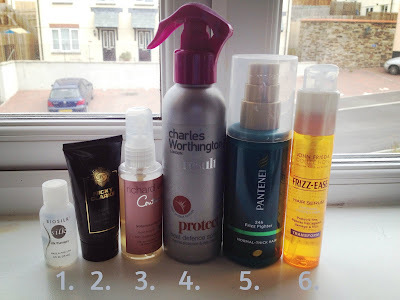 I wanted to do a blog post about products i use and i am trying out at the moment on my hair, I don't use ALL these products on my hair at once, that would be awful. 1. Biosilk silk therapy - This is one of my favourite hair products, i try not to use it all the time as i only have a small size and i really need to get the full size one before i run out. I got this with Glossybox a while ago and it works wonderfully on my hair. It makes it shiny and soft and makes the frizz go away, the instrucstions say apply from scalp to the ends of your hair but i only apply from half way down my hair to the ends. 2. Nicky Clarke instant calmer - i got this with my beauty calender for christmas and i had only ran out recently then Lucy sent me another with the box swap we did. This product feels a bit sticky in my hands but smells nice, i use it before drying and straightening my hair, i apply it from half way down my hair to the ends on damp hair. It makes my hair more soft rather then shiny but it still looks healthy, I don't need to use much of it as a little goes a long way. 3. Richard Ward volumiser root booster - This product says it is for thin, flyaway or fine/weak hair, i don't hair thin flyaway hair but seeing as my hair has got weak from all the heat and dying i like using this. I spray it all over my head when it's dry or wet it doesn't matter but i do it from 15/20cm away. I really don't like the smell of it but it's helped my roots a lot and i haven't even been using it that long. 4. Charles Worthington heat defence spray - my sister Stefi sent me this a while ago and it's lasted me ages, it is one of the best heat sprays i have used before and doesn't leave my hair looking frizzy, it protects from UV and everyday pollution and locks in moisture to your hair. I think this spray is discontinued but you can get one that is practically the same online in a purple bottle. 5. Pantene 24 hour frizz fighter - i have used this stuff forever it works pretty well on my hair because it's thick and curly. The bottle say it lasts all day and i wouldn't really agree with it, works pretty much for if i'm going out for a few hours but this bottle has lasted me a while i only need to use a little bit and it spreads really well in my hair. 6. John Frieda frizz ease - i thought i had lost this the other day, i was so annoyed about it because i use this the most out of every hair product i own. I love frizz ease it doesn't make my hair feel cakey from product build up and i only use the smallest size ever. It's good for a quick fix if you want your hair to look shiny and non frizzy straight away and for me lasts all day. I use a combination of products as well, and have wavy hair that goes into kinks if not blow-dried straight. I'm yet to find my Holy Grail products so I go through a tonne of things which need clarifying shampoo once in a while.